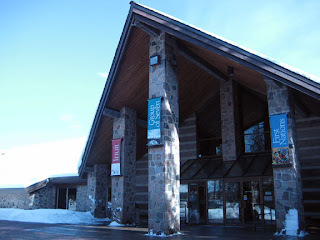 On Sunday we went to the McMichael Gallery in Kleinburg, Ontario. I hadn't been there before, and it was quite a different experience compared to our AGO visit. First off, the gallery is set back into the woods, with a gorgeous stretch of driveway leading into the parking area. All the trees were weighted with snow, the forest appeared begging to be painted by one of our beloved Group of Seven fellows. The gallery itself has a real "country bumpkin" feel, tons of lacquered pine, stonework and off white paint, a far cry from the modern slickness of the AGO. However, I found it much more comforting environment, like a visit to Grandma's cottage or something. The permanent collection had many gorgeous works from The Group and others, and boasts proudly their %100 Canadian content, which I thought ruled. The specific reason we were there was to celebrate the inaugural public viewing of the exhibition, A Brush with War: Military Art from Korea to Afghanistan. 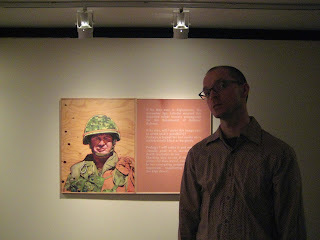 Our fellow painting family member Scott Waters was involved in the exhibition, displaying several works based on photographs from either his own experiences in the military, or from those he captured while spending time with soldiers in training through the Canadian Forces Artists Program. The Exhibition explores the two military art programs that started more than twenty years after the Second World War, the Canadian Armed Forces Civilian Artists Program (1968–1995) and the Canadian Forces Artists Program (2001– present). It is a truly amazing and haunting collection of works. 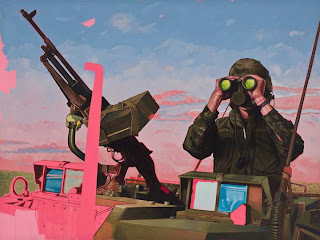 My favourite painting of Scott's from the exhibition is entitled "Keifer on OP", 2007. His use of hot pink and lime green is constant throughout the series, but the combination really sings in this one. Go check it out. The show runs until June 19th, and then travels onwards to London, Ontario.